Maria Dumlao’s Expanded Earthly World, a video and photo installation at Vox Populi, is a sensual vision of fantastical worlds apart from and beyond our own, a welcome respite from the cold slush of the Philadelphia streets. Tucked away into a dimly lit corner of the space, Expanded Earthly World consists of two dazzling projections on opposite walls, accompanied by rhythmic, percussive music created by the artist’s husband, Chris Forsyth. The exhibition presents a vision of nature and landscape as a living, breathing organism guided and shaped by the viewer’s perspective. The atmosphere of the works is a deeply meditative and spiritual experience, which at times verges on the religious. Dumlao, a multimedia artist originally from the Philippines, is a member of Vox Populi. According to Dumlao’s statement, she “explores the negative space, the spaces in between the lines.” Her dedication to the potential of undiscovered spaces, and creating entirely new ones, is on full display. The first of the two pieces of Expanded Earthly World, titled Expanded Tourism (To Make This Mundane World Sublime), consists of two 35-mm slide projections onto the wall, one just above the other. The top image is an outdoor sky at various times of day and from various locations, while the bottom image is an accompanying ground, be it a body of water, a field of flowers, or an asphalt road. Every few seconds, each image, both top and bottom, changes with a gentle click, each time creating ever-new combinations of sky and earth, suggesting new fantastical settings. Sometimes the colors of the top and bottom are similar: golden evening sky and a matching field of sunflowers. Other times the top and bottom images consist of complementary colors that startle and delight with their dazzling contrast. (Excerpts from Expanded Tourism. Photos taken by the author. The second piece, Solar Motel, combines two slideshows of nature images, video and animations, layered on top of one another. The overall image constantly evolves and morphs into new patterns and shapes, forming unreal, mythical settings that are nearly impossible to photograph. Every instant watching this hypnotic video is a new experience for the eyes. Blink and you’ll miss the breathless, playful combinations of snow-covered trees melting into glimmering sunsets. This kaleidoscopic work runs for a total of twenty-two minutes, and it’s worth it to watch an entire video. The video ends with a final red-and-yellow mandala form sinking down to the floor and fading away, much like the sun setting. Within a few minutes the video begins again with an image of a tentative sun peeking out behind an array of blue hills, creating a complete thematic circle from beginning to end. Towards the end of cycle, the subject of the video shifts from images and vignettes of nature to a series of radiating mandala-like forms, suggesting an underlying spiritual connection between the disparate images. 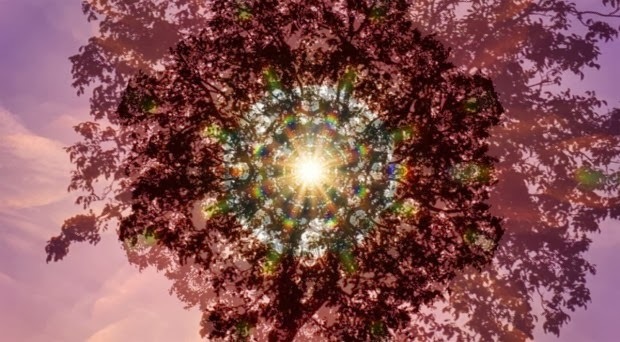 The fluid, loving depictions of nature at the beginning of the video, combined with the mandala imagery, underscore this worshipful comparison. While one person may direct their worship of a higher power through a mandala, another might channel one’s love through the worship of nature itself and all its forms. The exhibition itself is not explicit in this assertion, but this work certainly lends itself to it. The small nook Dumlao occupies in the gallery space functions like a sanctuary, where, accompanied by music, nature, and swirling, bright imagery, the viewer can reach for another state of mind and being. Our minds stitch together these strange, unreal scenes, creating an endless dialogue between creator and viewer. Since it contains only two formal works, Expanded Earthly Worlds may seem a small exhibition at first glance. Yet the ever-changing images Dumlao has created are expansive and magical, taking the viewer out of the gallery space and into panoramic world of spaces between spaces where anything seems possible. MOVIE REVIEW: "The LEGO Movie"
Happy 4th Birthday, I On the Arts!